Just checked the post from the other day and somehow I did not have the correct embed code for the video. Corrected and the video is now linked up properly. Sorry for the inconvenience. Video below discusses the reasons for the rope across the right path along #7. Path is going to be removed this fall. It will be kept large enough for walkers but that is all. All carts should use the left path in front of the red tee to enter along the fairway of Hole 7. Our Bermuda eradication spray is beginning to show up in some of our rough. See the picture below. The arrow on the left side is pointing away from the right of 12 green. This area was sprayed with a lighter rate of Pylex onto the collar and the first cut. You can see the darker green color. The two arrows on the right shows the effects at full rate on the Bermuda after only 2 days. You will see this in a few areas around greens and in some of our main rough. The left side of #11, around 13, 7, 10, 17 and 18. Along fairways 1-4, 10, 16-18. Mark Matteson who works for Clayco has located some dirt for us to fill in the old tennis court area and for some other uses on the course. There will be some construction trucks delivering soil to the back parking lot and the long range. I expect this will begin next week but have not actually spoken with the hauler. We will also be using our dump truck to move the soil to the tennis courts during this time. I just wanted to warn you regarding these large trucks entering and exiting the property. We continue to see progress in our Bermuda grass eradication efforts. I realize there are a few patches of red grass out there from the Bermuda going off color. 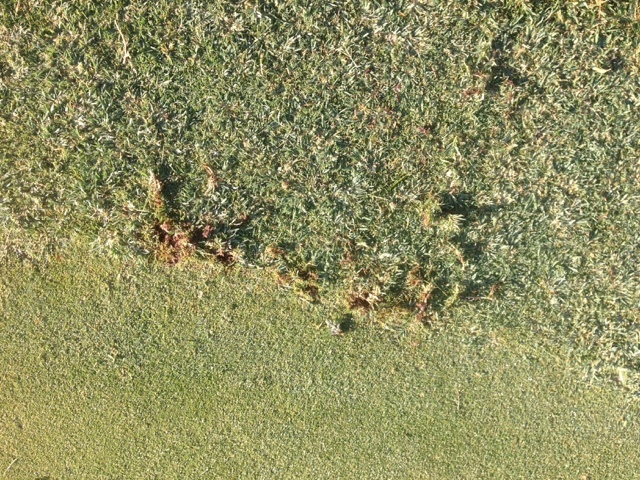 There is a great deal more carnage going on throughout the large areas of mostly solid Zoysia that you cannot see as well. Millions of wannabe big patches are being stopped in their tracks in our effort to get this situation under control. We've sodded 240 yards, over 2000 square feet of fairways space in the last two weeks with new turf where the voids are too large to expect the Zoysia to fill in. The largest patches we currently have are around the 150 yard mark on #10 which we will remove next week and some areas on #16, especially toward the green. As mentioned in the video below, we are beginning to go after some of our green collar and approach contamination and green/bunker surround areas with a product that is showing great promise at very low rates. More discussion about that early next week and the symptoms of this spray begin to take effect. For our Bermuda puller, this should be good news. We will have to backpack spray a few areas that have Zoysia that butts up against the collar and the Bermuda. The spray material also has negative active on the Zoysia so we do not want to create injury to it. These of course are multiple application sprays that will be repeated about every 3 weeks until dormancy. Coming out of dormancy next spring we will hit them again in an effort to set them back or kill them as we get into spring. Biggest blowout of the year including our 4 legged friends. 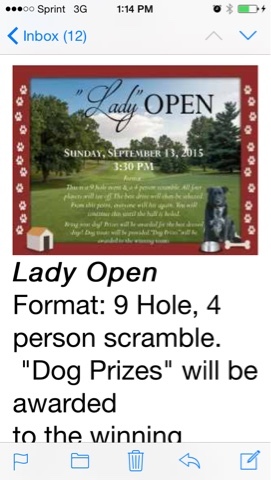 'The Lady Open Golf Tournament' is set for Sunday, September 13th. Go to the website to sign up your family for this fun event! The staff laid a couple pallets of zoysia this week, a pallet of fescue and sprayed fairways/tees in our Bermuda eradication work. We will try to cut out a couple pallets a week of Zoysia as play and work considerations allows until dormancy in early October. There are a few areas that have large patches of Bermuda that should be replaced. Zoysia will only move about a foot or two a year. Once the Zoysia covers these areas, we will make additional sprays over top of the Zoysia to discourage the removed areas from filling back in with Bermuda. I was intending to spray some greens surrounds and bunkers with a new Bermuda Eradication product called Pylex herbicide but was not able to get that accomplished. Maybe Saturday or early next week. More details on this product next week after I make the applications. Randy, Rico, Latrell and Tom cutting out the bird bath area about 225 yards on the left from 7 green. Had to remove some extra soil at the end which was helping to hold the water in place. Finished product. Please drive around and play as Ground Under Repair until we remove the stakes. Area on the left of #8 fairway which receive much less than ideal sunlight during the day to support Zoysia. Hopefully some selective tree trimming, traffic control measured and compaction reduction will improve this area. 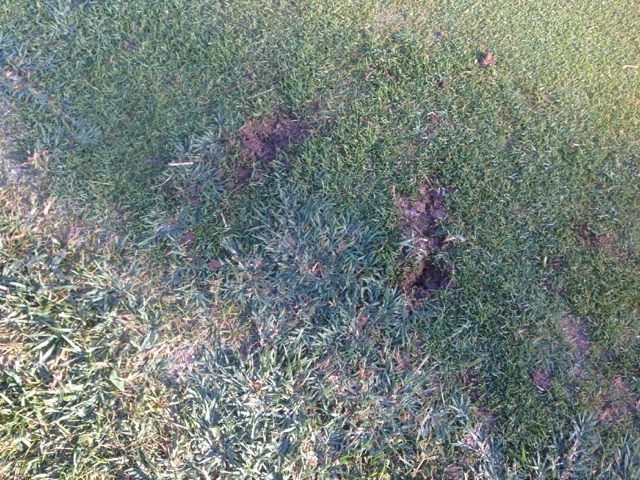 #15 where some large patches of Bermuda have been living. Trying to spray these areas out and replacing with Zoysia. This is a picture of 18 fairway about 150 yards from the green. You can see the heavier dew formation on the Bermuda grass. Larger patch in the background which could need to be replaced with sod once the eradication spray takes effect. The foreground area should burn down below the surface of the Zoysia grass and will need to be applied again toward mid-September. Late applications reduces the Bermuda's ability to store energy for winter making it vulnerable to winter kill. An application or two in spring and early summer followed by 2-3 applications in fall should help us put this weed on its heals. We might never get rid of it but we can put it under serious control in our main playing areas like our fairways. We usually maintain the trees that screen the golf course from Lucas & Hunt Road. We do some shearing and pruning from time to time along the roadway so road signs can be seen and the area is dressed up. We keep it mulched and try to keep the weeds down with herbicide sprays from time to time. Yesterday for some reason, the State Highway Department sent a vertical mower along the roadway and trimmed some of the trees. At first I thought great, one less thing for us to do but then I saw today that no one had picked up the limbs and branches that were strewn between the fence and the street by the mower. I've contacted the highway department about getting this cleaned up. I'm assuming it will take a couple of business days to get this completed. Just wanted to let you know we were aware of this issue. 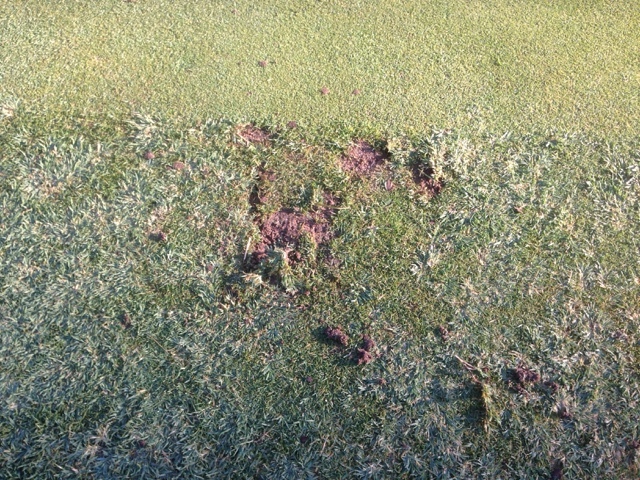 New damage on 6 green collar from someone who continues to pull out chunks of Bermuda from collars. I've asked in a recent post for this practice to stop and explained why. It damages turf or grass cover that we have and leaves a bare area and a hole which your fellow members might be forced to play from. I will post this message in the locker room and score posting station today. If you would like to have a conversation with me regarding the Bermuda contamination and why its there, I would be more than happy to do so. Besides our green turf, it is the most problematic plant on our property and it covers probably every spot on our property except directly under trees in deep shade. 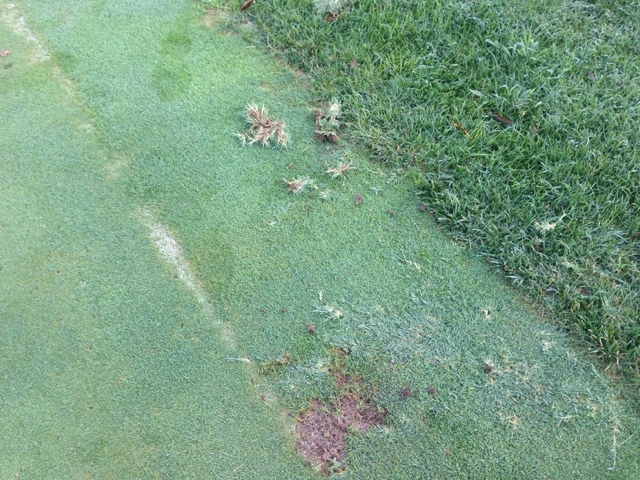 Please quit damaging our playing surfaces no matter if it's a plant that is not supposed to be there or the intended turf. The remnants on a 9" plate from one small section of 6 front collar. Happy Anniversary, 7 Years Who's Counting, Let's Move On To The Eighth! It been a whirlwind both professionally and personally. A lot of good things have happened over the last seven years. A great deal of sweat equity by our staff and treasure by our membership to help keep this dream alive since 1901. Thanks for your support and feedback over the last 7 years. I look forward to another great year at Glen Echo CC! Just made our 2nd spray on our fairways to help us reduce the impacts that Bermuda has on our Zoysia grass fairways. Video attached below discussing our work. I'm going to make our last spray about the 3rd week of September to allow the Zoysia a chance to recover before dormancy. I believe our Bermuda will be hurt pretty severely by then and will be ready for a good killing over the winter! Interesting video regarding the Super from Whistling Straits and the course for this week's PGA Championship. Should also recognize Michael Lee CGCS as well is The Manager of Golf Course Maintenance. Managing 1000 bunkers, my head hurts! Bermuda grass on our collars is a never ending battle. We gain in some areas and lose in other areas. Seeing the clumps of grass or runners are tempting to pull but the aftermath of your work on our greens is not good at best. The example below is what someone did on 17 green on Thursday. There is now a hole there that is 6" by 6" and will be there for the rest of the season. I hate seeing the stuff as well but there are times of the year where we have to live with grass and weeds that are either in the wrong place or not controlled. Higher temperatures encourage weeds to be at their peak and our sensitive turf areas react negatively to chemicals during the heat. 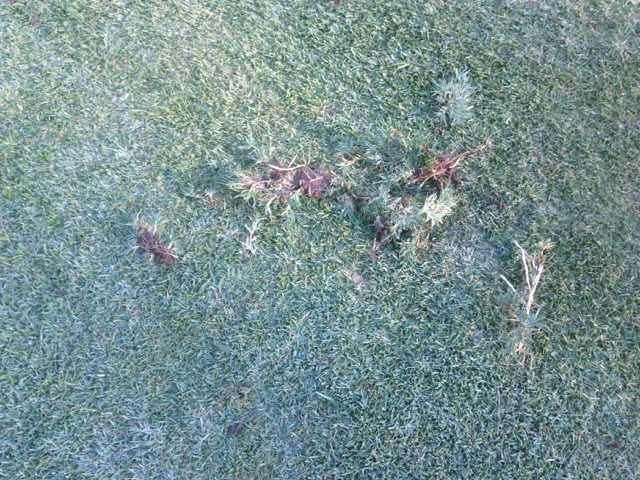 Please refrain from pulling Bermuda grass that is attached to our greens and collars at this time. We will begin chemical treatments in a few weeks that we hope will reduce some of these issues. At this time of year, green is good no matter what kind of plant it is. Collar now damaged and pulled Bermuda grass left in place. Bermuda eradication work is going well with our first spray that took place around July 23rd. Short video which stopped before I could complete my explanation(maybe my camera is telling me something). Larger Bermuda patches are pretty obvious from the red color that the Bermuda gives off as the chemical is taking effect. I was not trying to scare everyone off when I made the post regarding take your pictures now. I just knew that areas of the course would not look quite as green as they did but they still look pretty good when you see the effects the chemicals are making on the Bermuda. It will take more applications to get a pretty solid kill. The overwintering spray has a tendency to be the most effective. I will make another application in the next couple of weeks and will complete the third application toward the end of September which will help us considerably for next season. Some of the Bermuda areas that are intermingled in the Zoysia are not as easy to locate but their are plenty of areas like this that we need to continue to hammer with these products to help push them out completely. We do have some pretty serious issues with contamination in our intermediates in which some areas have little or no Zoysia. The left side of 10, right side of 5 and a few other areas where the Bermuda has moved from the rough into the fairway. This is coincidentally the areas which are sometimes shaded as well which discourages Zoysia and encourages Bermuda. Some of these areas will be treated with RoundUp and killed off completely and then sodded. I might do a couple of these just before dormancy this fall and then replace them in the spring with new sod. Looks like it is dead anyway when it goes into dormancy and will help us next spring get an early jump on sodding. On Tuesday, E&E Enterprises whom we contract with to vent our greens with the Hydroject machines arrived on property and completed our 100K sq/ft of greens in about 4 hours. A very short video of a couple seconds posted below. Did not realize I had my camera set on time lapse at the time and they were gone when I decided to put the video on YouTube. As usual, 4-5" in depth improving our greens in a number of ways with gas exchange, oxygen in, carbon dioxide that builds in soil out. Improved rooting with channels formed that are full of oxygen. We do not get a lot of new roots this time of year due to high soil temperatures, just checked this afternoon and at 2" of depth about 90 degrees. Also improves infiltration of water and drying of areas with excessive water. Deep-tine aerated our Zoysia tees last week with an 1/2" tine to a depth of 4-5". As you know, we core aerated a couple of weeks ago so a 2nd aeration in less than a month. This should improve drainage on some tees which have large amounts of water running over them because they are at ground level and water drains across the tee. We hope to rebuild a number of these tees over the next few years to improve playability and turf quality. Intend to get the rest of the bare spots in fairway areas covered with Zoysia in the next few days. We will also go after a few cool season rough spots near greens and bunkers with some fescue if we don't get too warm to start improving areas for the late summer and fall. I Intend to take our green height back to our normal height of cut for the weekend since our weather appears to be moderating. That will result in an actual height lowered by the thickness of 1 piece of standard copy paper. Hope to see you out on the course over the next few weeks. A much warmer and wetter July than 2014 as you will see from the statistics below. July was 47th warmest July on record. Record highest minimum temperature of 84 degrees set on 7/18. Previous record of 83 degrees set in 2012. Ties 6th warmest minimum temperature on record in St. Louis. I take great pride in providing The Glen Echo Grounds Maintenance blog. Regular updates discuss the work that takes place on the grounds of our historic 115 year club. Please contact me if you have any questions or comments at jwachter@gecc.org.